In October 2014 the UN Secretary-General appointed the High-Level Independent Panel on UN Peace Operations. The Panel is reviewing developments in peacekeeping and special political missions over the last decade and a half and providing recommendations for the future developments of peace operations.Through the UN Peace Operations Review (UNPOR) project, NUPI has been supporting the work of the Panel since its inception. The purpose of UNPOR project is to generate recommendations from several key constituencies for the Panel, to help increase the empirical basis, evidence base, diversity and relevance of the Panel’s recommendations, and to help ensure that the Panel’s findings are based on the broadest possible range of inputs. NUPI researchers are involved in preparation of regional consultations and thematic workshops and in providing research inputs to the work of the Panel. 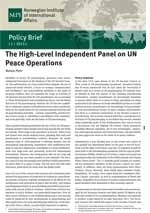 Will the High-level Independent Panel Manage to Revitalise a New Generation of UN Peace Operations?